RAF Typhoons train together Croatian MiG-21 fighters. RAF pilots landed in Croatia at the start of a joint training event to find the country still in full celebration of its' valiant world cup performance. Two RAF Typhoons landed at Zagreb within minutes of the world cup losing finalists' plane touching down. After taxiing in they found the pilots from the Croatian Air Force that had escorted them into the country's airspace wearing the distinctive red and white check football strip under their flying suits. 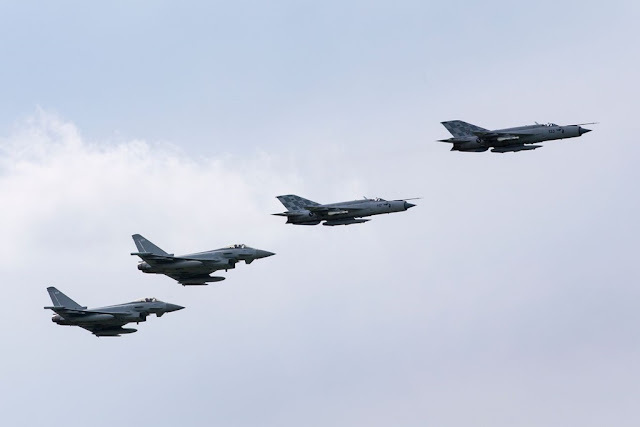 The joint training event involving crews from 1(F) Squadron Royal Air Force and the Croatian Air Force (CAF) Fighter Squadron is the first of its type involving the two countries. The aim is to build on increasing defence understanding between the two nations and exchange valuable experience between air and ground crews. At present the CAF flies MiG21 fighters and getting first hand knowledge of the Typhoon's capabilities will enable future co-operation in the air and a better understanding of how each of the air-forces operates. Squadron Leader Ellis Williams who is leading the RAF detachment said he and his team were looking forward to a productive week in Croatia and to soaking up the football fever which has gripped the country. “It is a great pleasure to be here to work with our Croatian counterparts and it is a real bonus to get here on the same day as their national team comes home just to catch how much it means to them”, Williams said.